If you already have an ecommerce website or are just looking to get one started, you know that one of the most important considerations is decding who you will use for your ecommerce hosting service. Some web hosting providers offer very basic ecommerce services, like an optional free shopping cart download, and then say they are an ecommerce host. Others truly understand what it takes to have an ecommerce site and make sure that you have everything you need and that every aspect of your ecommerce website will be supported. 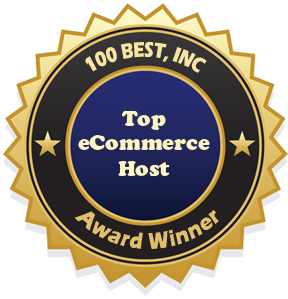 PrecisionWeb has it all, that is why we have awarded them the Top eCommerce Host award. As we were reviewing the PrecisionWeb ecommerce features, there were a number of things that stood out right away. We will take a few minutes to review these top ecommerce hosting features to help you decide if PrecisionWeb is the best ecommerce host for your business website. Search Engine Friendly Shopping Cart: having a shopping cart that is search engine optimized (SEO) is incredibly important. From optimized page titles and category listings to SEO urls and alt tags for images, every aspect of your site will be optimized to help you rank higher in search engine results. Free Website Builder: PrecisionWeb uses the Parallels Plesk SiteBuilder to help you create the exact look and feel you want for your eShop. With over 400 customizable templates, you can add the text, images, colors, and layouts that work best with your product or service. In just a matter of minutes you will have your ecommerce store ready for business. Free Secure Directory: providing a safe, secure transaction every time is vital for every online business. PrecisionWeb provides free SSL (Secure Socket Layer) encryption through their secure server. Be sure and sign up for this free service to make sure that all of your customer’s personal information is transmitted securely. Payment Processing Options: with PrecisionWeb you will be able to choose from more than 20 major real-time payment gateways to accept credit cards online. It has been estimated that online businesses who accept credit cards profit from nearly 70% more sales as those who do not accept credit cards. You can not afford to not accept credit cards! These are only a few of the top ecommerce features from PrecisionWeb. Visit their site for complete details on all of their ecommerce hosting plan features. The Hosted Shopping Cart plan starts at only $14.95/month, making it one of the most afford ecommerce hosting plans available. In addition, setup is free and their services are backed by a 100% money back guarantee. Each site is guaranteed to have 99.9% network uptime because all PercisionWeb networks are monitored 24 hours a day. If you have questions or concerns you can contact a PrecisionWeb sales or service representative by phone or email. Their site also offers an extensive FAQ for immediate answers to commonly asked questions. Visit PrecisionWeb today to see why 100Best Free Web Space has named them our Top eCommerce Host. This entry was posted in Uncategorized and tagged best ecommerce hosting, precisionweb review, top ecommerce host. Bookmark the permalink.